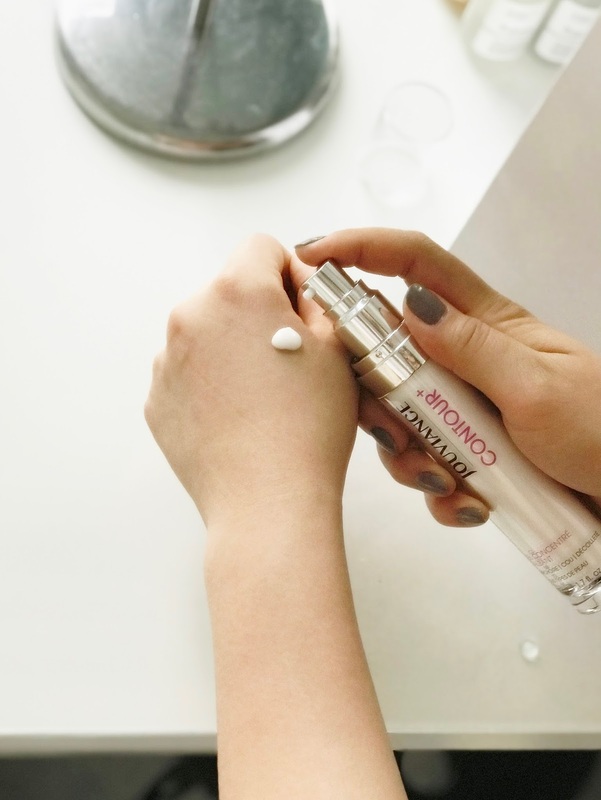 A few weeks ago I received the opportunity to try out a brand new skincare product from Canada's leading anti-aging skincare company, Jouviance. As a newbie to Jouviance, I really had no idea what to expect, but since attending the launch of Jouvinace's Contour+, I have to say I am extremely impressed by not only their passion for sourcing effective ingredients, but also their transparency with consumers, and I'm looking forward to using more of their products as a preventative measure to keep my skin looking youthful. For the past two weeks I have been using Jouviance's Contour+, an anti-aging neck sculpting gel concentrate designed to firm up the neck and reduce wrinkles and lines. It also helps to reduce the appearance of laugh lines and marionette lines, resulting in reshaped facial contours, fewer wrinkles, and improved skin firmness, elasticity and hydration. The active ingredients in Contour+ contribute to all of those benefits. Packaging-wise, the product comes in a pump cylinder, with 50mL/1.7 oz. of concentrate. I love how high quality the packaging is, considering the price point of $78.00 CAD per bottle, although for a high quality anti-ageing product, I don't find that surprising. If anything, it is in the mid-range price point for these types of products. The high quality list of ingredients, research, and data is also reflected in the price per unit. In terms of personal experience, after two weeks of using Contour+, I have noticed improved firmness and tightness around my neck area. After one application, I also noticed an immediate lifting effect which over time will improve even more as the full effects of this product will be most prominent after two months of use. I love how it has a light, citrusy scent that is very mild, and it also applies like a gel serum even though it comes out white of the tube. This makes it very easy to spread and massage around my neck and decollete area. 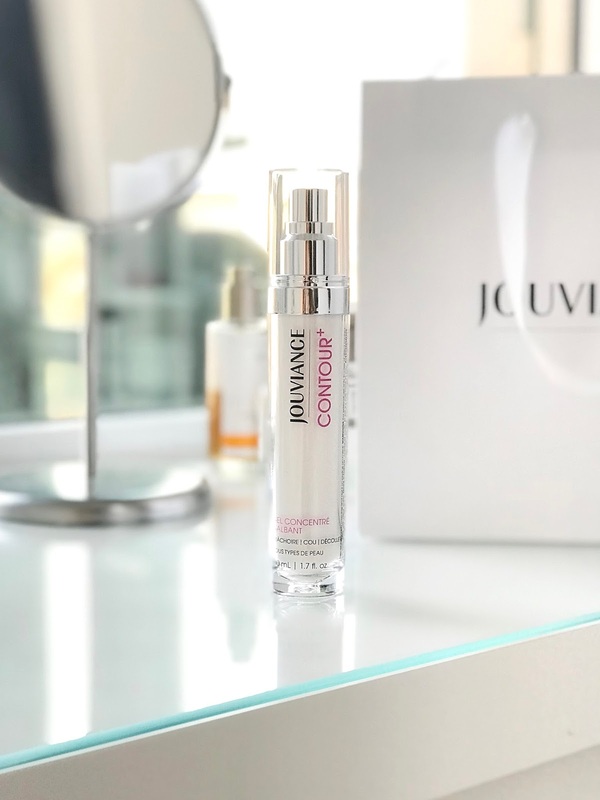 If you're looking for an effective solution and prevention to combat ageing concerns around the jawline and neck, I would say Jouviance's Contour+ Neck Sculpting Gel is for you. As I get older, the more I am willing to invest in skincare, because great skincare (combined with diet and exercise) means great skin, and even though I love makeup, I also love not wearing a lot of makeup on a daily basis. Contour+ helps with uneven texture, skin firmness, anti-aging, hydration, and more, so I definitely think the investment is worth it. You can find Jouviance products at your local Shoppers Drug Mart in the high-end skincare aisle. If you wanted to learn more about Contour+ Neck Sculpting Gel Concentrate, you can do so here. Disclaimer* Press sample sent for review.